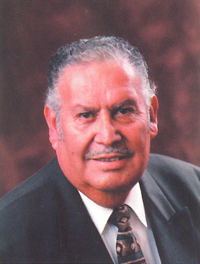 Abel Jiménez was Bishop Supervisor of the Interior California and Nevada District for thirteen years, the longest serving Bishop Supervisor of that district. Currently the Pastor of the 1st San Bernardino Apostolic Assembly, he founded the Apostolic Assembly in Ontario, California, a church in which his son, Pastor David Jimenez, now shepherds. He saw the District grow from twenty churches when he received this responsibility, to becoming the largest district within the Apostolic Assembly, counting with over sixty churches and missions at present. He directly supervised the expansion of the Apostolic Assembly into California’s Antelope Valley and the state of Nevada. A longtime elder and District Board Member, his faithful and persistent service is a testimony of true episcopal vision. In 2013 he donated his papers to the Historical Archives.